Photos courtesy of Emerson College. The now complete $85M Emerson College of Los Angeles (ELA) is set to easily become one of the county’s most iconic structures: located in the heart of Hollywood along the Sunset strip, it’s bold, 10-story tall geometric shape—echoing the famed CCTV building by OMA in China—will alter the Hollywood skyline. 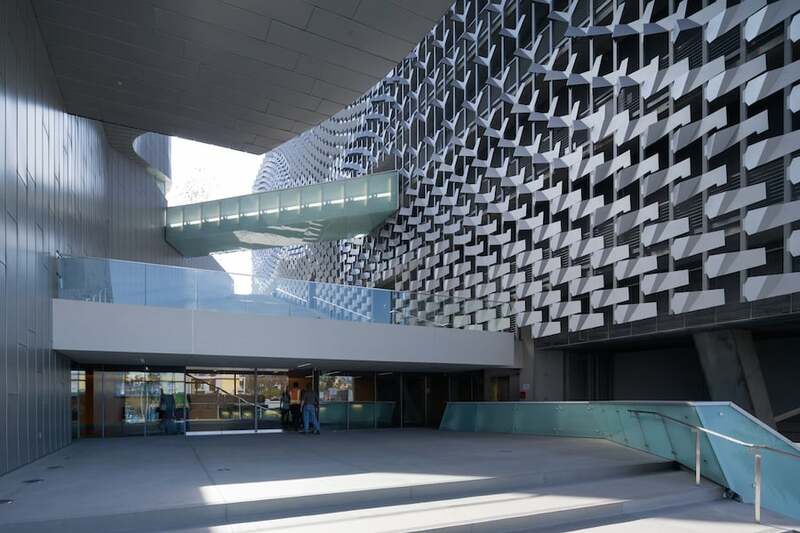 Designed by Pritzker Prize-winning architect Thom Mayne of Morphosis, the new space will house 217 new students (which is more than double the current amount held at the private college’s temporary Burbank space). The 107,400 sq. ft. building (with 120,000 sw. ft. underground parking three levels below ground) will have 159 single rooms, with 8 designated for resident assistants; 24 double-rooms, and 4 staff/faculty apartments. The Boston-based private college—with a $49M endowment—the Los Angeles program is geared specifically towards providing students semester-long professional internships in entertainment-related and media-related positions. In its 27 years, over 4,300 have partook in the program.